The story of Colorado’s railroads is one of perseverance, daring and ingenuity-it is the story of settling and taming the Wild West. 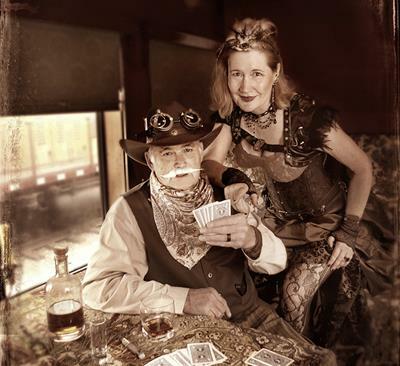 Celebrate the Wild West and Steampunk with “The Great Train Robbery” during the Colorado Railroad Museum’s Wild West Steam Days. The Great Train Robbery will feature a whole slew of outlaws, lawmen, ladies and gentlemen as professional actors bring the 1880's Colorado railroad experience to life with train robberies and gun fights over lovely damsels. We will have local Steampunk vendors on site with wares you won’t find anywhere else. Also, don’t miss Blacksmith Sam all weekend and Sunday. Catch a ride behind the historic steam locomotive but be careful, your train might get hijacked! It is the Wild West after all. Admission: $20 adults, $10 children (2-15), $15 seniors (60+). Museum members and Children under 2 are free. Admission is valid all day and includes activities and unlimited rides behind a steam locomotive. Rides operate 10:00AM to 4:00PM.Advance tickets are available online. Tickets will be available at the door until 4:30PM. Thanks to our partners Visit Golden & SCFD and sponsor All Support All Computers.